Considering my video-workshop Sketching People In Motion is in full swing, I couldn’t pass up this speed-sketching workout. This event was three hours of slow motion fighting. 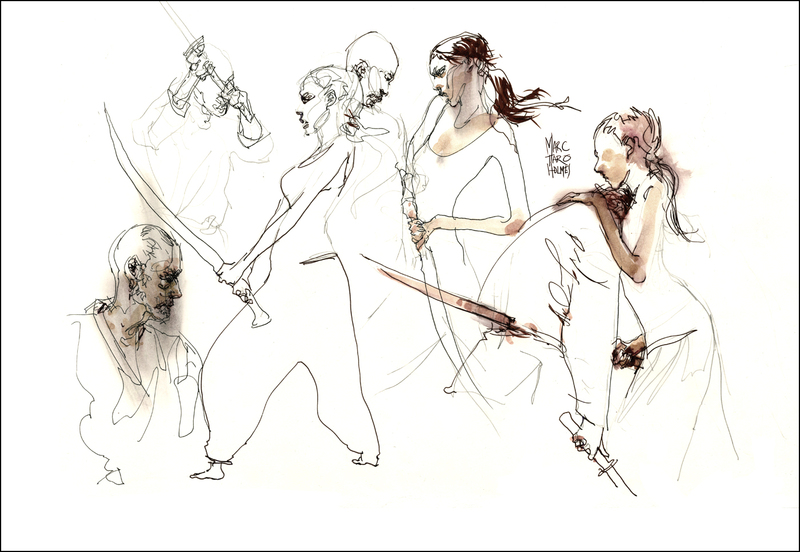 They would work out a combat exchange, making sure to take turns dying, and we’d sketch furiously as they moved through it in slow motion, repeating the sequence four or five times. Occasionally they’d freeze a pose for a while – but never the most dynamic ones. Impossible to freeze yourself begin punched up on your toes like a cartoon boxer :) Sometimes they’d be ‘helpful’ and rotate their combined axis – supposedly showing us another angle – but really just messing us up completely. 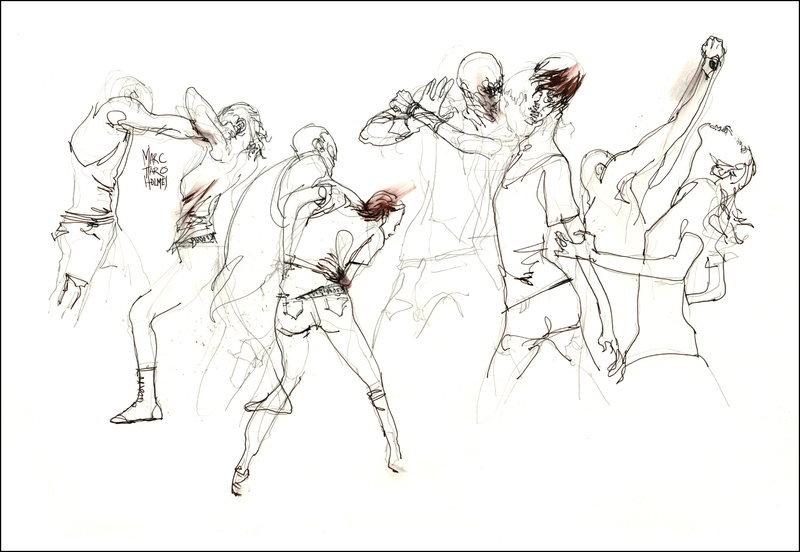 You can see visible evidence of the three-step sketching process in these drawings. It was going so fast I didn’t always finish the figures. I’m starting with a pencil, doodling through the first slow mo, and then coming back for refining detail in ink as they repeated the sequence five or six times through. Usually I’d focus on refining faces and hands. 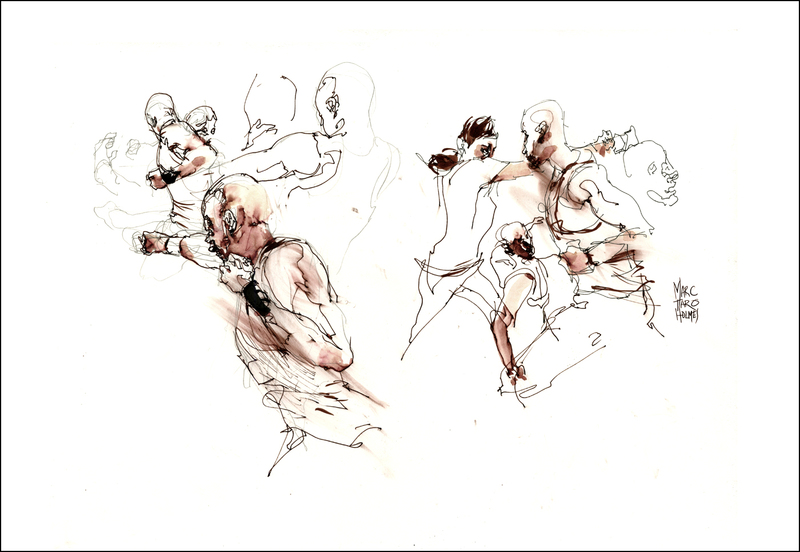 In the breaks between fights I’d place some darks with a brush pen. I have Kuretake Sumi Brush in the red barrel version loaded with a 50/50 black/scarlet ink mix, just for these occasions. The blurred red effect is smearing the fountain pen ink with a bit of paper towel. Other color notes were made with watercolor melting the dark red pen line. I suppose some of this looks a little violent. But you have to imagine them doing it in a light-hearted manner. Cracking jokes and making crazy faces. Dying with lots of gurgling sounds. It seems like a good job for a couple of over-grown kids. These are 15×22″ on some 20 year old unidentified 100lb-ish paper stock. (Felt a lot like Moleskine classic paper). I used three art boards with sheets taped on both sides, so I could draw faster. Just swap boards and keep drawing. No waiting for the ink to dry. Wet boards are leaned up against my chair while dying. Swapping back to old boards in the breaks for brushpen and watercolor. 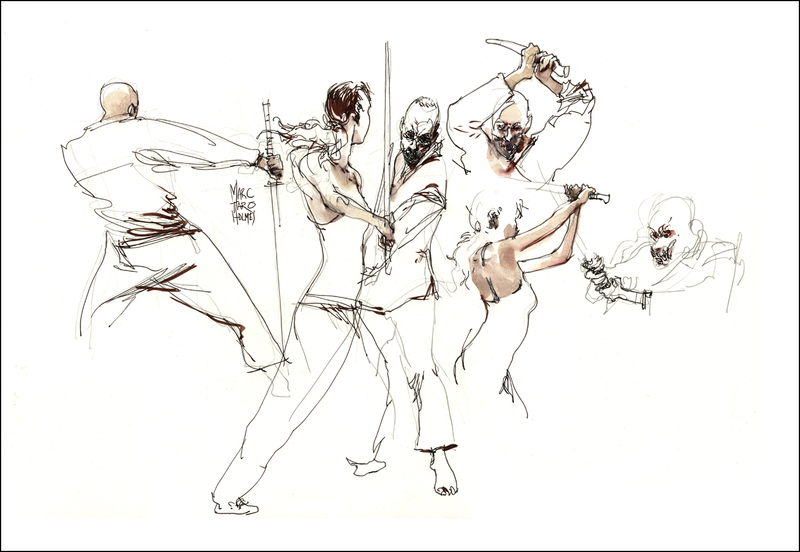 Brilliantly dynamic sketches and I love that the very minimalist sketches add an energy and vibrancy to the more detailed ones. I’m always happy when you share examples of numerous subjects all on one sheet. I think it’s my most difficult bump to overcome – interesting compositions. Always love what you do with those. Thanks for sharing details on the process! I appreciate everything you have shared. This fast-paced activity would have knocked me over. I finally gfot up the courage to try something similar watching my grandson ice skate the other day. 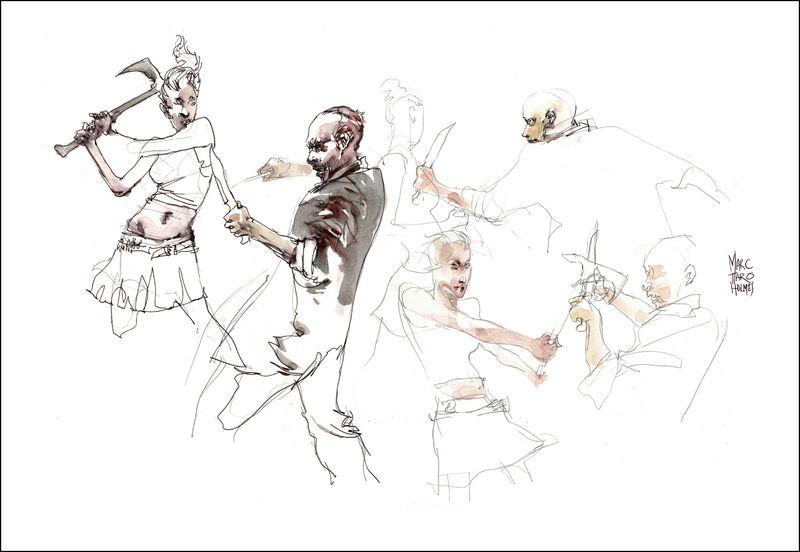 While there is not ONE finished sketch on the pages, I have little parts of the movement. I just might do this again. I had to get over the kids asking me what I was doing, as my sketches were pretty bad! That’s great! That is just the right attitude. Doesn’t matter if you get a finished one when the action is going by so fast :) Great! I really enjoy your posts. Please keep up the great work! superb! thanks for sharing! and now the song is in my head. You would get good marks in my class! I was bummed to miss this, I often don’t get to draw them that much when I’m teaching. hope they do it again. Hi Marc–I signed up for ‘People in Motion’ at Craftsy.com. Viewed a few videos and am so pleased with how much info that you impart. Will be trying out some tips today! Hey Carmela – great to hear! I’m glad people are liking the class :) It was fun to do, I hope to get a chance to do another.